Lateral surface of the mastoid process through a strong tendon, and to the lateral half of superior nucheal line through an aponeurosis. Rotation of the head to the opposite side or obliquely rotate the head. It also flexes the neck. When acting together it flexes the neck and extends the head. When acting alone it rotates to the opposite side (contralaterally) and slightly (laterally) flexes to the same side. It also acts as an accessory muscle of inspiration. There are reports of a broad clavicular head splitting into multiple small muscular slips. The number of these extra clavicular slips may vary and such occurrence may be unilateral or bilateral. They cause formation of supernumerary lesser supraclavicular fosse. Developmentally, these additional muscle slips indicate abnormal mesodermal splitting in posterior sixth branchial arch. They may not cause any functional advantage or disadvantage in neck movement but might be physically interfering during invasive procedures. However, they can be effectively utilized for muscle flap harvests. There are also cases presenting with extra sternal and clavicular heads of origin in SCM.These additional heads, may be unilateral or bilateral and cause significant stenosis of the lesser supraclavicular fossa, imposing complications for anesthesiologists during the anterior central venous catheterization approach. Benign fibrosis, hypoplasia or aplasia of SCM is the most common cause of congenital torticolis. Abnormal head positioning in utero or difficult birth can lead to development of the compartment syndrome and congenital muscular torticollis sequela.Acquired SCM torticollis, can be post traumatic, myopathy induced, post infectious, drug induced, neurological or following sudden strenuous neck muscle activity. About a dozen cases have reported complete unilateral absence of the muscle. Such cases represent the developmental defect of muscular agenesis and are diagnosed by Ultrasound or Magnetic Resonance Imaging scans. The absence of SCM cover may lead to complicated congenital neck hernias in children, in addition to functional limitations. A coexisting unilateral absence of SCM with the ipsilateral absent trapezius is an extremely rare variation and till date, only about three such reports are present in literature .Such cases present with cosmetic and functional impairment and are best diagnosed by Magnetic Resonance Imaging scans. 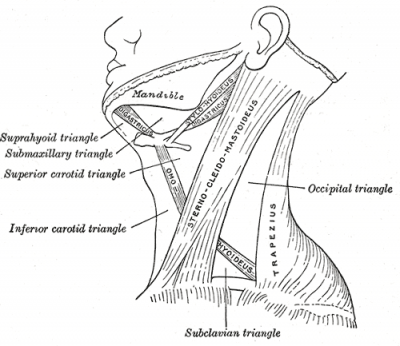 Occasionally, the lower portion of the SCM muscle is intercepted by tendinous intersections which indicate the origin of this muscle from different myotomes .The organizational pattern of the SCM can be arranged into five distinct topographical parts, namely the superficial sternomastoid, profound sternomastoid, sterno occipital, cleidomastoid and cleidooccipital parts which are arranged in superficial and deep layers. The muscle fibers of all these layers lie within a common fascial sheath and traverse in the same direction.Knowledge of this layered arrangement and the changes in cases of muscle variations is helpful during muscle flap harvesting procedures.